One of the best ways to protect your PC is to keep all your software up-to-date. Patching over security holes blocks online attackers who like nothing more than exploiting old software flaws to surreptitiously install Trojans and other malware. 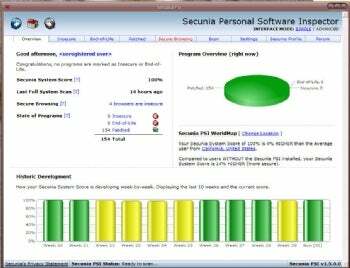 The free Secunia Personal Software Inspector makes it easy to find and fix old programs--even those that lack automatic update features--on your PC. Secunia PSI scans your computer to find out what versions of what software you have installed, and it reports on which might contain known security holes. Be real: You're not going to check every program you have to see if it's the latest version. Secunia PSI can do it for you. But the excellent app doesn't stop there. Secunia PSI also provides clickable links to download available patches or program updates, which makes updating most software a snap. Other helpful icons can open the program's folder, bring up online references for any security advisories, and perform other useful tasks. Less technical users can opt for a simple interface mode that lists only easy-to-patch software. But it's worth trying the advanced interface, which displays a wealth of information about your installed software. The latest version includes a handy "Secure Browsing" tab that reports not only on your browser version(s), but also on any plugins, ActiveX controls, Firefox add-ons and other extras. By default, Secunia PSI will start with Windows and report on new software or newly discovered security holes. Gamers and anyone else who wants to conserve system resources can turn off those options using the settings tab in the advanced mode, and instead run manual scans. Secunia PSI won't do away with the need to run a good antivirus program and firewall on your PC. But it provides a solid layer of free protection that no PC should do without.